Start-up company Crossbar Inc. emerged from stealth mode on Tuesday to reveal a new class of Resistive RAM (RRAM) technology that could potentially disrupt the NAND Flash industry. The company said it's new generation of non-volatile memory is capable of storing up to 1 terabyte (TB) on a single 200mm2 chip, enabling users to store 250 hours of HD movies on an IC smaller than a postage stamp. "Due to its simple three-layer structure, Crossbar technology can be stacked in 3D, delivering multiple terabytes of storage on a single chip," the company said. "Its simplicity, stackability and CMOS compatibility enable logic and memory to be easily integrated onto a single chip at the latest technology node, a capability not possible with other traditional or alternative non-volatile memory technologies." Crossbar's RRAM solution is based on three simple layers: a non-metallic bottom electrode, an amorphous silicon switching medium, and a metallic top electrode. The resistance switching mechanism is based on the formation of a filament in the switching material when a voltage is applied between the two electrodes. Crossbar's RRAM can be easily incorporated into the back-end-of-line of any standard CMOS manufacturing fab, the company said. In addition to the potential storage capabilities, the company's RRAM promises to deliver 20x faster write performance, 20x lower power consumption, and 10x the endurance at half the die size when compared to today's "best-in-class" NAND Flash memory. It has a large on/off ratio that improves as cell size shrinks, and provides 1/10th of programming current for low-power applications, 2 to 4 times more data (MLC) and 1 to 3 more stacking layers for greater density. The company said the cell's low temperature allows it to be stacked in multiple memory array layers on top of the controller CMOS. Larger arrays and higher densities are possible thanks to a lack of joule heating eliminating cross talk between cells during the switching event. Cell switching is based on field dependent switching, leading to no read or program disturb below the critical field. Crossbar said it has also developed a working Crossbar memory array at a commercial fab, signaling a readiness to begin the first phase of commercialization. The company plans to bring to market standalone chip solutions, optimized for both code and data storage, used in place of traditional NOR and NAND Flash memory. There are even plans to license the technology to system-on-chip (SoC) developers for integration into their next-generation chips. "Today’s non-volatile memory technologies are running out of steam, hitting significant barriers as they scale to smaller manufacturing processes," said George Minassian, chief executive officer, Crossbar, Inc. "With our working Crossbar array, we have achieved all the major technical milestones that prove our RRAM technology is easy to manufacture and ready for commercialization. It’s a watershed moment for the non-volatile memory industry." For more information about Crossbar's RRAM, head here. If this holds up to the promise, it'll be awesome! Enough for the press release, release it to market. And like all amazing breakthrough disruptive technologies that will save humanity from the apocalypse....it will be ready in a few decades for commercialisation once it has satisfactorily assured the Republicans that it will not open a rift directly to the bad place from their favourite children's story-book. Holy cow this is impressive. And revolutionary. Best of luck on their success! You must be an Obama fan(atic) to bring up any political party for the article. Panasonic announced recently that they are starting production this month HERE. seems cool, but what about its pricing? No word on write cycles? How does this compare to ReRAM? It says they can incorporate logic in the chip. Is this NAND or NOR logic gates? Could this lead to 3D microprocessors? What is the switching rate compared to conventional silicone transistors? The endurance is phenomenal at 1E6 compared to 3000 or less for current NAND. 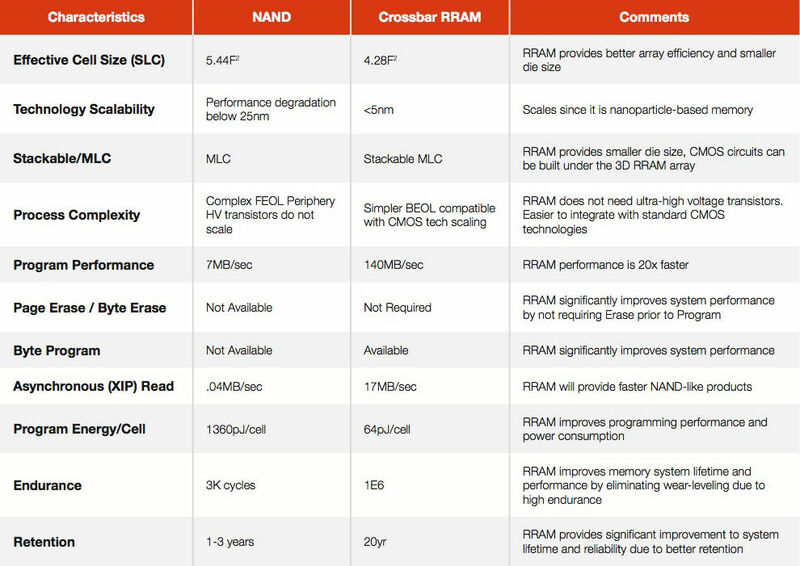 HERE is a great chart that compares NAND and RRAM. RRAM appears to be much better in every way. So is Samsung committing Seppuku right now although they are Korean and not Japanese? Hot tip for "professional" writers who keep forgetting the difference between its and it's: MS Word has a grammar-check. This is hardly disruptive tech...it's the future of flash. This is horrible news. It is going to take forever to find and remove the terabytes of bloatware that will be installed on phones. I bet at least one person from Verizon just creamed their pants. This reads like an April fools day joke. If that's true, battery lives, heat, capacity... a whole new class of device becomes possible. Combine this with graphene batteries and we got some killer phones. SWEET!!! 20 times faster than flash with more space to boot! Bye Bye Harddrives. Unfortunately, like all great ideas this technology is probably under patent and Crossbar probably wants a lot of money to license it and that will kill the tech before it even has a chance. Unfortunately? If it wasn't for patents, this technology, like all great ideas, wouldn't exist. Experiment: Can Adding RAM Improve Your SSD's Endurance?